We have eyes but the eyes do not see everything. We have ears but the ears do not hear everything. Why should we have a brain, that is able to understand everything? You have the possibility to see my ingenious brain. Ähh, where is my brain? My head is empty? And the brain is as big as a flea? And my nose is bigger than my brain? Never mind! 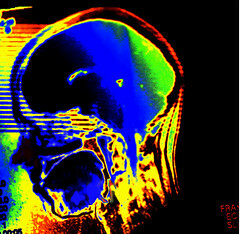 One radiograph of my head. I have photographed the radiograph as a macro and changed the colours in photoshop. But the outlines and everything else is the same as the radiograph, so you see the roundnesses of my head. I don´t know what the points in the middle are, I called them brain. Der Mensch hat Augen, die nicht alles sehen. Der Mensch hat Ohren, die nicht alles hören. Warum sollte er dann ein Gehirn haben, das alles versteht? Ich habe ein Röntgenbild meines Kopfes (von einem Computertomographen CT aufgenommen) als Makro fotografiert und dann die Farben in Photoshop geändert. Du hast die einmalige Chance mein geniales Gehirn zu betrachten, wenn Du es denn findest.